If you love sports and you love the slots, you’ll be pleased to know there’s a great collection of Olympic themed slot games available at our recommended online casinos. From the ancient world of Olympus where it all began to the epic worldwide event that we know and love today, check out these fun Olympic themed pokies created by some of the industry’s leading online software developers. Go back to where it all started from by delving into the ancient world of Greek mythology thanks to an incredible design by Rabcat, powered in a partnership with Microgaming. You won’t find any of the modern day sports equipment or bustling Olympic stadiums here, just some incredible graphics featuring Greek Gods like Zeus, Poseidon, Aphrodite, Hades and Ares battling it out with a series of bonus features, in full cinematic quality animation. The Olympic Games as we know it today can be traced all the way back to Ancient Greece in 776 BC, an event held every four years in dedication to the Gods in link to the religious festival of the cult of Zeus. 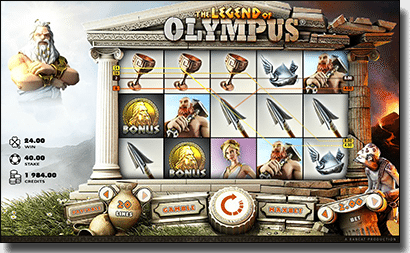 The Legend of Olympus pays homage to this rich history while giving players some big chances to win. iSoftBet’s Olympic Slots captures many different aspects of the Olympics and compresses them all into one action packed pokies game. When the game opens up you’re given the choice to select which country you want to play as, either Italy, Germany, France or England, choose wisely as you’ll be stuck with this country the duration of your game play (although whether or not any country is set to win more than another is entirely up to speculation). Spin the reels to an Olympic stadium background to the cheers of a supportive crowd with the hopes of landing any of the games several lucrative bonus rounds. 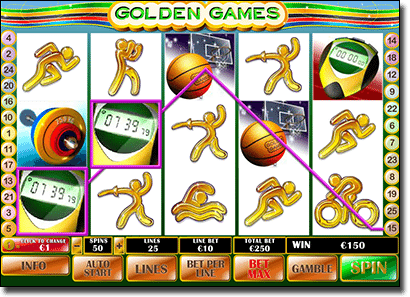 There are three progressive jackpots and a bunch of fun Olympic Game Bonuses which take you to these awesome little mini games like the 100m race, 50m swim, speed skating, javelin, pole vault, the ring, diving and long jump. Playtech’s Wild Games combines the thrills of the Olympics with the eye-catching and entertaining use of animated characters, so even if you’re not a sports or athlete fan, you’ll fall in love with these kooky little critters. 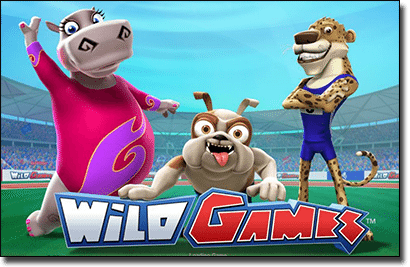 Wild Games features three main characters: the perfectly manicured hippopotamus gymnast, the charming cheetah runner and the snarling bulldog swimmer, each animal featuring its own bonus game (100m Dash Bonus, the Freestyle Swim Bonus and the Balance Beam Bonus) triggered by the appearance of its attributed stacked wild symbol. Landing three or more matching gold, silver or bronze medals anywhere across the screen will also award you with a medal bonus and the game’s wild symbols can multiply your winnings by up to five times. 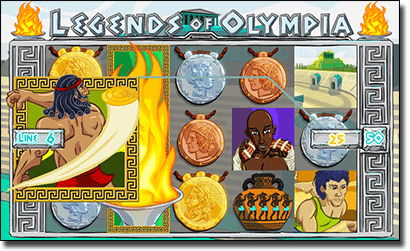 Legends of Olympia is another pokies that tips its hat to the ancient days of Greece and while Saucify’s version is nowhere near the same level of quality as Rabcat’s The Legend of Olympus, this game offers a good perspective of what the original Olympics may have been like. Using cartoon symbols of strong Greek athletes and ancient medallions, the animated characters really add to the gameplay, coming to life to throw discus’s, set aflame the Olympic torch and throw javelin’s across the reels. The game features expanding wilds and free spins where all wins are multiplied. Golden Games is a little old-school in terms of graphic quality, sound effects and bonus features and may not have enough zest to keep some punters hooked, but those who like their online pokies on the simpler side can still have some fun with this one. The game definitely stays true to the Olympics theme, with not a symbol that doesn’t represent something sporting associated, from weights to stopwatches and little golden athlete icons. There’s not too much to report on the bonus front, but an appearance of the Olympic flame bonus symbol on both reels one and five will reward you with 20 free spins on a 2X multiplier. GamesOS Olympic Slots is a little lacklustre compared to the games mentioned above but while you won’t find the same level of animation or bonus features, you’ll still get a kick out of this game if you’re a big sports buff. It’s more sports themed than Olympics themed, with the reels set within a soccer field and symbols containing sports equipment like boxing gloves, baseball bats, golf clubs, basketball hoops and tennis racquets. The trophy symbols are the ones you really want to be on the lookout for, as five silver trophies anywhere across the reels will trigger 30 free spins while three gold trophies activate the bonus game. 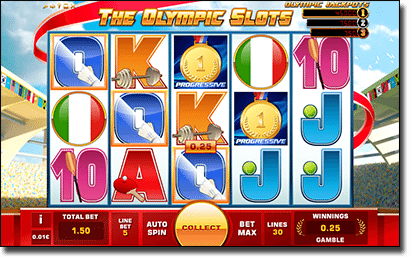 All of these Olympic themed pokies along with 867 other popular slot titles can be found at Slots Million, one of our highly recommended real money pokies sites. Slots Million features pokies from leading software providers like Microgaming, Net Entertainment, Next Gen, iSoftBet, Rabcab, Thunderkick, Rival, Playtech and many more, with a range of secure deposit options.